Our creative directors begin every website project with one goal in mind: to create a beautiful and highly customized look that is supported by inviting copy and smart navigation. They work closely with the digital marketing team to monitor and analyze the performance of every site, and integrate new content across all marketing platforms. Santé offers a unique shopping experience at its Princeton, New Jersey, store. The store needed a website that would distinguish it from large chain pharmacies and online retailers by emphasizing quality, personal service and hard-to-find brands. VolunteerConnect is a nonprofit organization serving a two or three distinct audiences. Our challenge was to make it easier for viewers to navigate to the information relevant to them. We also needed the site to look sleek and professional, without having a budget for custom photography. 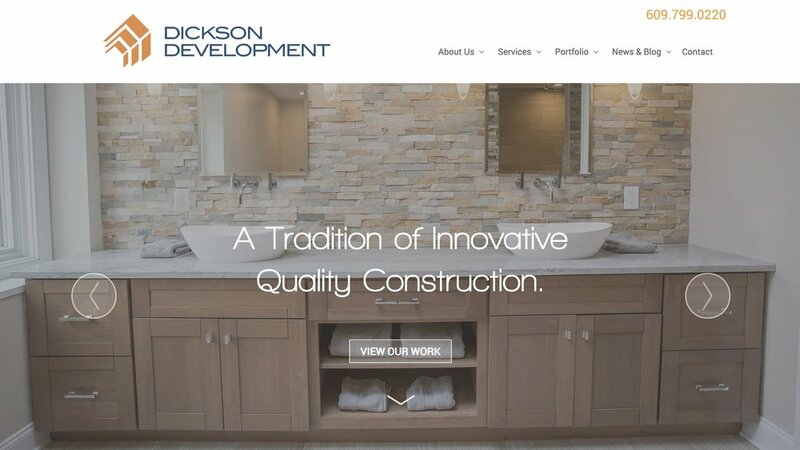 Dickson Development needed a website that would showcase the builder's work and serve as the foundation for a digital marketing campaign. This site is full of useful information as well as beautiful photos of spectacular home renovations. The sound of alchemy crystal bowls playing is hauntingly beaitful and remarkably soothing. The bowls themselves are works of art. This website needed to bring this healing form of meditation to life through video, photography and simple yet beautiful text. We build most of our client sites on Word Press platforms. We are happy to discuss customizing another website builder or creating a completely custom site for you.